EEG stands for electroencephalography, which is the measurement and recording of electrical activity in the brain. EEG biosensors have been around for decades, but until recently they were very expensive. Neurosky is a Silicon Valley company that sells EEG biosensors, some for as little as $79.99 from Amazon.com. 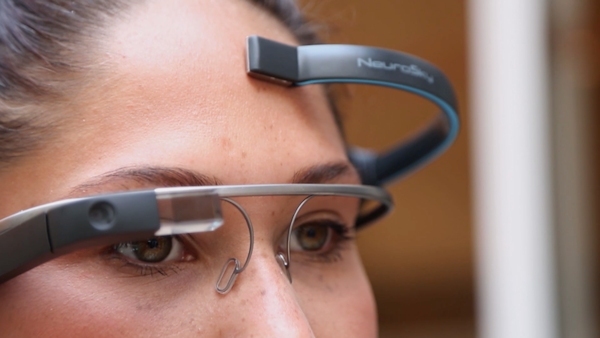 The system works by pairing the EEG biosensor with Google’s $1,500 Glass device using Bluetooth. Once the connection has been made, the user fires up MindRDR, which takes what the EEG biosensor detects and converts it into commands that Glass can process. After turning on the app, users will see a camera interface on the screen of their Google Glass. They can then pick a subject, aim their head in its direction, and concentrate on it while Glass displays a meter showing the level of their brain waves. The more intently a user focuses, the higher the meter climbs until it reaches the top, triggering Glass’ camera. By repeating the process, users can direct MindRDR to upload the photo to one of their social networks. For now MindRDR can only be used to snap pictures, but This Place Chief Executive Dusan Hamlin said he hoped the agency would continue developing the software so that it could eventually help users overcome mobility limitations. Specifically, Hamlin said he would like MindRDR to help people who suffer from locked-in syndrome, in which a patient has lost motor control but remains aware and alert, as well as quadriplegia. “The ability to be able to use their mind to make outputs to a device could be a huge thing for them,” Hamlin told the Los Angeles Times in a Skype interview. But the possibilities for MindRDR extend beyond the medical field. Hamlin said he sees MindRDR as the launching point for a world where people can interact with their digital devices by simply thinking about what they want. To that end, This Place has uploaded the code for its software onto GitHub, a popular website used by developers to share code they create with others for free. “What we’ve done is just scratch the surface, and we hope that we’ve inspired people to build on what we’ve started,” Hamlin said.